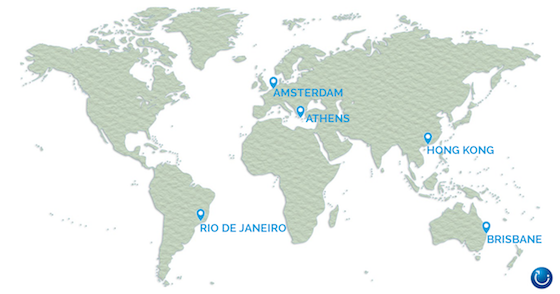 We recently travelled to Helsinki with Finnair, transiting in Hong Kong, with flights from Australia to Hong Kong operated by Cathay Pacific. Here’s our review. 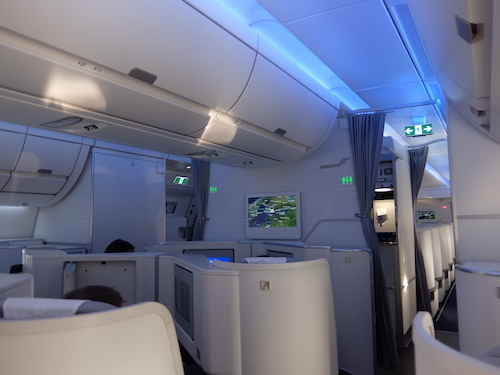 First of all the Finnair business cabin is split into 2 sections, the second section (rows 9-12) is smaller and we felt it was a little more private than the larger front section. 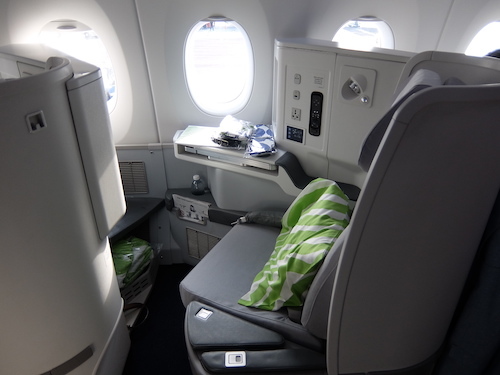 The Finnair business cabin is split into 2 sections with the second section being slightly smaller. On our first Finnair flight, From Hong Kong to Helsinki we sat in 9D and 9H, the 2 middle seats in the first row of the second section of business class. At first glance these seats are close to the galley and the bathrooms, however as the bathrooms don’t open into the aisle, but rather into the exit doorway this wasn’t an issue. There was some noise from the galley, however this was handled by wearing the noise cancelling headphones, and the benefit of not having a window seat that can see into your cubicle is an added bonus. Each seat includes a side table, handy for drinks, and a retractable table which slides out infront of you for dining. 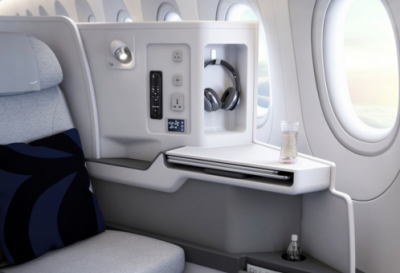 Storage options include a special water bottle holder (tucked under the table), a pocket to keep the inflight magazine, menus etc and a storage bin on the outside with a lid which was handy for glasses, books, headphones phone etc. 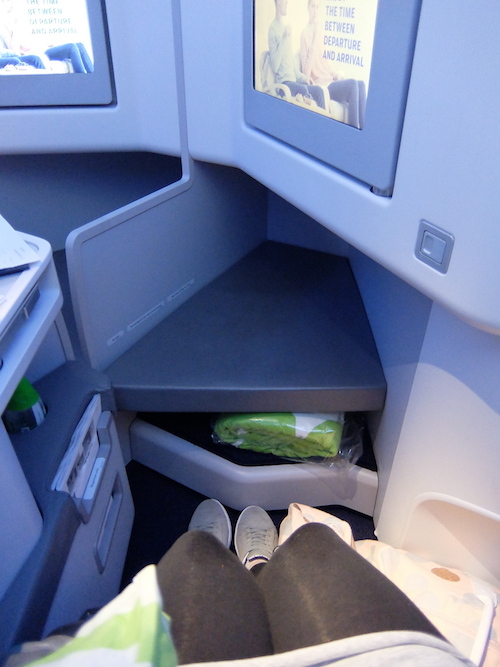 Under the footrest was also a small cubby that could hold a small handbag and a pair of shoes. Storage under the footrest, in this photo contains the quilt. 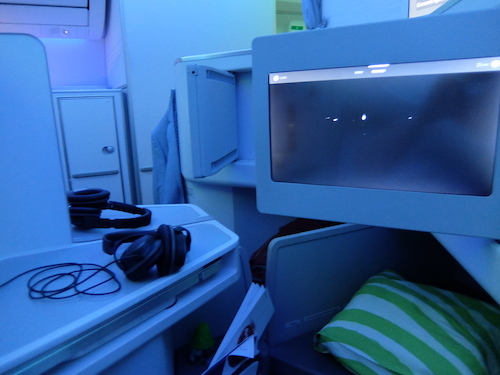 One point of discussion around the Finnair middle seats has been the positioning of the screens, as you can see from the photos below, when both passengers have their screens locked in place the, the other passengers screen is quite visible from your seat. However when flipped out into viewing position this issue is eliminated. When the screens are viewing position the issue of glare/visibility from the other seat is eliminated. 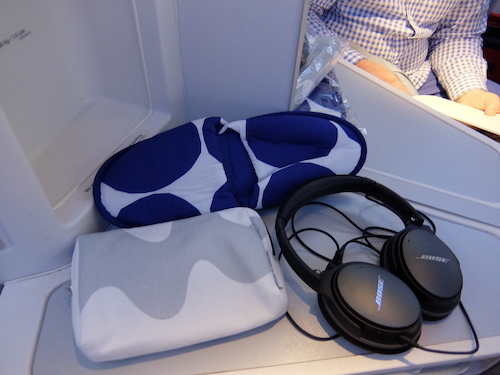 Upon boarding we were gifted with an amenity kit and slippers (convenient for mid flight shuffles around the plane) in Finnair’s signature Marimekko design, along with Bose noise cancelling headphones for use during the flight, which honestly were better than I expected and really did make a difference to inflight comfort. Onboard gifts include an Amenity kit and slippers. 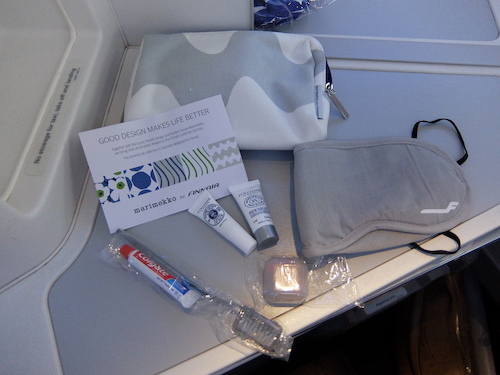 Finnair amenity kit included skin products along with eye mask, ear plugs, and tooth brush kit. 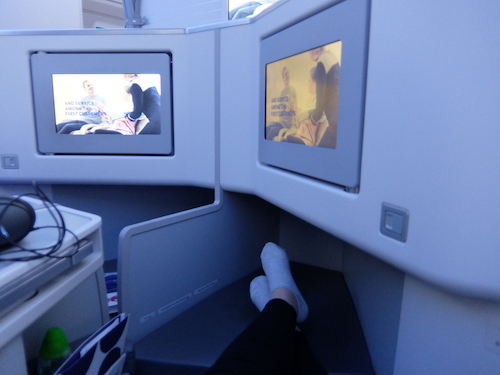 The Hong Kong to Helsinki flight departed Hong Kong at midnight so needless to say we were quite focussed on sleep on this flight, so after a quick meal (which you can read more about on our Finnair Food blog) it was time to convert the seat to a bed. 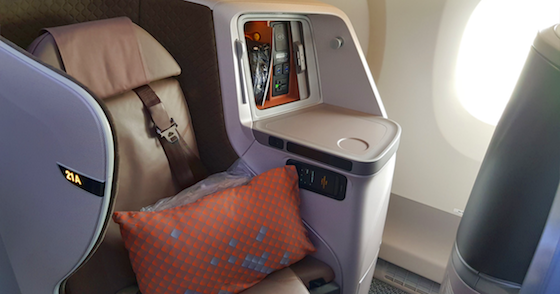 The seats need to remain fully upright during take off and landing, however once you’re in the sky it’s simple to convert the seat to a bed at the touch of a button. Finnair business class seat controls. 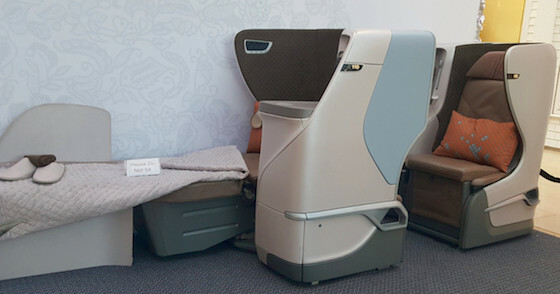 The controls include a button that will take the bed straight down to bed, another that will return the seat to a fully upright position, and individual controls to move the seat and back rest independently to choose your preferred seating position. At the touch of a button, the seat converts to a 2 metre long fully flat bed, with the seat coming forward to meet the footrest and the back rest folding all the way down. The shell of the seat creates an enclosure providing plenty of privacy. 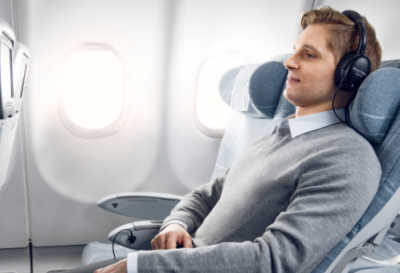 The Finnair business class seat converts to a 2m long fully flat bed. 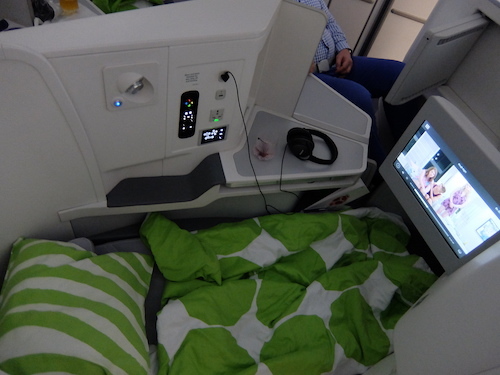 We were provided with a pillow and quilt, also in the signature Finnair Marimekko design, which were warm and cosy, and we found the beds to be very roomy, both in length and width, with space to sleep comfortably. On the return flight we were on the 5:25pm departure from Helsinki, so we were much more awake and ready to enjoy the flight, so therefore selected window seats. 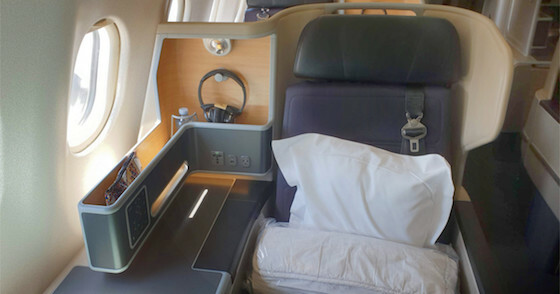 With the seats angled towards the windows, these seats are a great option for flyers who like to enjoy the view, and also for solo passengers as there is no shared space at all. 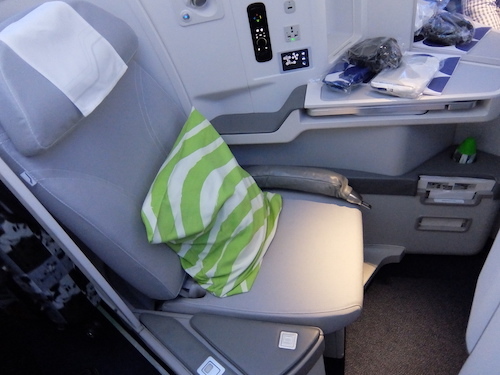 Finnair business class window seat. The 12.1 inch entertainment screen flips out from its enclosure to a viewing position that is perfect for any seated position. The only downfall is that as the screen doesn’t tilt its difficult to see the screen when lying down. 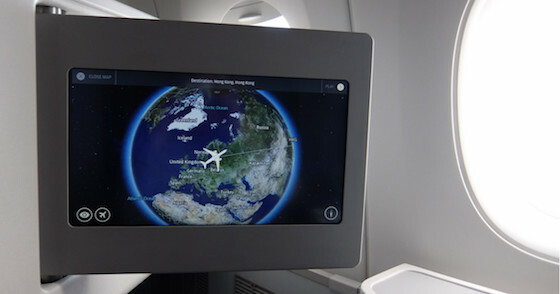 Finnair 12.1 inch touch screen. The entertainment screens feel very large with a high picture quality. 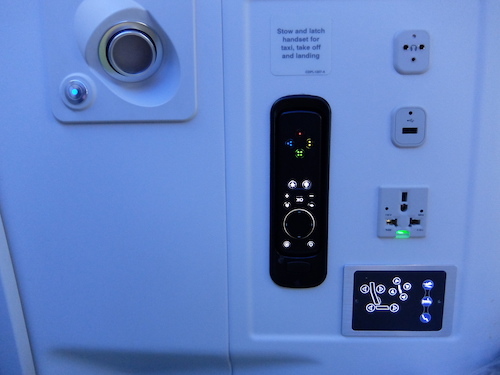 They are touch screen and can also be operated by a remote that is tucked into your control panel (as seen in the earlier photo, next to the seat controls). 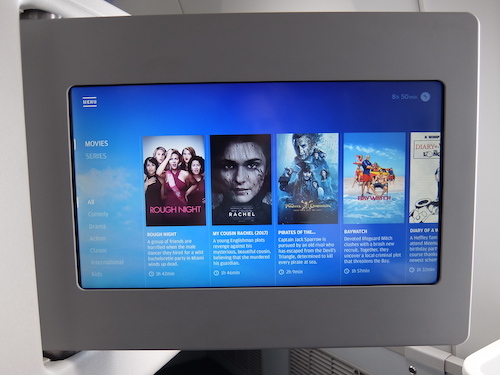 The on demand inflight entertainment contains a variety of movies and TV shows, the selection isn’t as wide as on other airlines but it include some latest releases and plenty to keep you entertained when not snoozing. Inflight entertainment includes new release blockbusters. 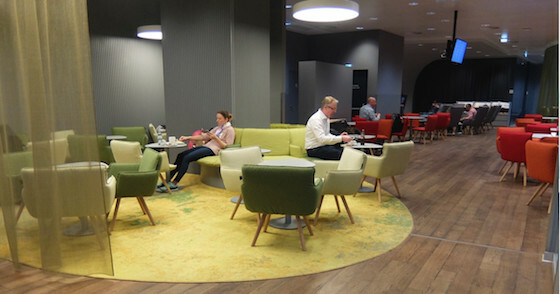 Continue reading … You can read our review of Finnair’s inflight dining here. Departing Europe, view from Finnair’s A350.